Quiz: What’s more important? Sleep or a healthy diet? Go on, think about it for a moment before you read on. Obviously, we need both for perfect health, right? Have an answer yet? Okay, let’s see if you’re right. The answer is: sleep. Congrats if you knew! No worries if you guessed wrong, because diet comes in at a very close second place. Why is sleep more important than diet? Sleep, when “done properly,” is the time your body recovers from a day’s work. Your liver is doing some all-important detoxing, your muscles and brain relax, and you’ll wake up with the energy needed to carry you through the next day. When you get the recommended eight hours of sleep per night, your brain function will be better and your memory will improve. You will have fewer cravings and, therefore, you’ll be much less likely to put on weight. So, with all of that said, you should buy that new special mattress that hugs your body tight and lets you sink into it like a cloud, right? Well, not quite. As it turns out, you may get much more restful sleep if you sleep on the floor. To set the record straight, there are no studies that confirm or deny the benefits of sleeping on the floor. However, there is plenty of anecdotal evidence to be found by a simple Google search. Those in favor of sleeping on the floor rave about the benefits and how much better they sleep now that they discovered this new (old) way of sleeping. After all, we’ve done it for thousands of years before the invention of the mattress. Of course, we don’t have any records of ancient civilizations telling us how awesome they felt sleeping on the floor. The top recommendation by floor sleepers is to sleep on your back. Because your body doesn’t sink into a mattress, you don’t have to tense up and, in turn, your muscles can relax. The theory is that lying on your back aligns the neck, shoulders, spine and hips, and this leads to better posture. If you’re a side sleeper (like myself), it only takes about a week to adjust to sleeping on your back, according to a friend of mine who does it. Millions of Americans suffer from lower back pain and neck pain for a variety of reasons, such as long hours in front of a computer screen with poor posture or sitting in traffic for hours on end each week. Sleeping on a wooden floor may help to eliminate this pain by letting the spine stretch out and the hips align as mentioned above. When the body has the ability to completely “let go,” circulation improves, muscles relax and lower back and neck pain may just become a thing of the past. Note: If you choose to sleep on the floor, make sure to use a small pillow or roll beneath the neck for a bit of support. There are several recommendations for when and how you should start sleeping on the floor. Some recommendations say to try it gradually. To use this approach, lie on the floor for 10, 20 or 30 minutes before going to bed and increase your time on the floor each night. This process can take up to a month. On the other hand, others suggest that you should just get started right away. The first few nights may be difficult and increase your pain, but then the promise is that you’ll sleep so well on the floor that you’ll never go back. You might try to do this when you have a few days off because there is a good chance you won’t get those recommended eight hours during your first three or four days. 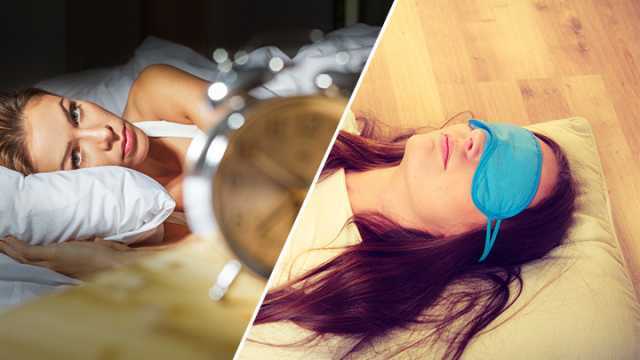 Those of us who are just not quite ready to take the plunge onto the hardwood floor, there are a few other sleep hacks we can try. Since I’m a side sleeper and not quite brave enough for the floor full-time yet, I know all the ways to improve my own sleep. The body loves nothing more than a routine. When exercising, that may not be the best idea, but for improved sleep a routine is absolutely vital. Personally, I don’t function well when I do not get my eight hours of sleep. I wake up with headaches and brain fog and I’m craving sugar all day long. So, my bedtime is 10 p.m. Always. I don’t care if it’s the weekend and everybody wants to sit outside until all hours of the night. My internal alarm clock wakes me up at 6 a.m. no matter how late I go to bed, so I oblige and hit the sack by 10 p.m. Undoubtedly, you have heard this information before. Looking at phones and tablets before bed exposes you to blue light, which tricks the body into believing it is daytime. Melatonin is released as if it was the middle of the day, making it more difficult to fall asleep and stay asleep. I recommend putting away all electronic devices at least 30 minutes before going to sleep. Grab a book or magazine instead. It is probably not a good idea to read anything too captivating as it may lead to reading until the early hours of the morning. If you have electronic devices in your bedroom, you probably have little green and red lights illuminating your space. And if you happen to live in an urban area, you have added light from outside. If you’ve looked at a city at night from the distance, you’ll know just how bright they can be. Try to cover these lights and install some blackout curtains if you can, so you can rest in total darkness and get the kind of relaxing sleep you need. Imagine it’s nighttime. You’re watching your favorite TV show and your hands and mouth are empty. You’re hungry for a snack — what do you do? If you must eat after dinner, avoid refined sugar and chips. Processed carbs, high in sugar, will delay the ability to fall asleep and you may even wake up in the middle of the night when you come off that sugar high. Eat some nuts or fruit instead. My go-to snack at night is a homemade trail mix of mostly almonds with some cashews and sunflower seeds. And for my sweet tooth, I add half a handful of dried cranberries or raisins. Make sure to stop eating about an hour before you go to bed. I know, it’s easier said than done when you have a life full of to-dos. However, those duties won’t run away. They’ll be right there tomorrow. Something that I find helpful is to write my to-do list before bed just to be sure I won’t forget anything. And on those evenings when I worry about something, or I’m upset, I write a couple of pages in my journal. Then I close the book and consciously release all worries and anxiety. A little mindfulness work (meditation) can also go a long way. Just can’t seem to shake the anxiety when you go to bed? I recently heard a great trick from a friend of mine. She used to have a hard time falling asleep due to high anxiety and restless leg syndrome, and she was a sleepwalker during the night. However, since purchasing a weighted blanket, her sleep quality has vastly improved. Plus, the sleepwalking has been gone for more than a month. She’s in better spirits now than she has been in a long time, and there is research to back up the usefulness of weighted blankets. Regardless of what you are willing or ready to try, be it sleeping on the floor or using a weighted blanket, I hope that my tricks will help you to experience the kind of quality sleep that improves your overall health and wellness. Sweet dreams! Hey Buddy!, I found this information for you: "Can’t Sleep? Try Sleeping On The Floor (And Other Sleep Hacks)". Here is the website link: https://www.thealternativedaily.com/sleep-hacks-for-insomnia/. Thank you.